Another week, another rom-com. 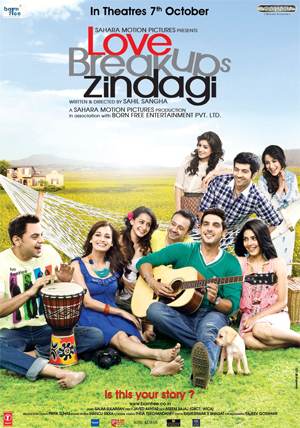 This week it was Love BreakUps Zindagi, a film from the newly formed production house Born Free Entertainment, the baby of Dia Mirza, Zayed Khan and Sahil Sangha. The promos gave a fresh vibe and hence, despite the lead roles being played by not-so-inspiring actors like Zayed and Dia, I sat down to watch Love Breakups Zindagi hoping to be surprised. Even though LBZ didn’t surprise me, didn’t entertain me much, it wasn’t a total disappointment either. Directed by Sahil Sangha, the cast also included Cyrus Sahukar, Umang Jain, Tisca Chopra, Satyadeep Misra, Auritra Ghosh, Pallavi Sharda, and Vaibhav Talwar. Jai (Zayed Khan) and Naina (Dia Mirza) are young, successful and upmarket, so is their circle of friends. Stuck in unsatisfactory relationships, they meet at their friends’ wedding and sparks fly. The sparks keep flying over coffee and over conversations until they realise they love each other and…well, you probably can guess the ending. Between the sparks-start-flying and happily-ever-after there are some sweet songs, some light humour and some good looking actors trying their best to rise above the predictable story. Ah yes, there is this cute little track about a 38 year old unmarried woman (Tisca Chopra) and a twice-divorced younger guy (Cyrus Sahukar) which deserved more screen time than it got. Other than the Tisca-Cyrus track, LBZ is full of all the clichés in the romcom textbook, though to give credit to the debutant director (Sahil Sangha), he has tried to bring in a certain freshness to his treatment which makes one feel that he could do a much better job with a better script. This one is a bit too bland and it doesn’t help that the lead actors have neither the chemistry nor the individual charisma to elevate the movie’s flatness. To give them their due, both Dia and Zayed have given their career best performances. Tisca and Cyrus are very good in their respective roles and the rest of the supporting cast is decent too. Technically the movie is sound in all respects, though better editing could have helped. The music is pleasing to the ears and songs are well choreographed. A special mention must be made for Dia’s beautiful outfits. The guest appearances by some Bollywood stars (including a superstar plugging the brand he endorses) don’t do much for the film. My final take – it is difficult to rate a movie like Love Breakups Zindagi, which isn’t good enough to be called a ‘must-see’ nor bad enough to be called a ‘must-not-see’. It hovers somewhere in the middle, and I guess for that I will rate it 2.5/5 and politely call it a ‘decent attempt’. If you don’t mind predictable rom-coms and like sweet movies with no negative characters, LBZ may be a nice weekend time-pass for you.